The photo on the left was taken on the 22nd of April, 2007, several months before I had my Tylee Cottage residency show at the Sarjeant Gallery. The stitched-together photo on the right was taken yesterday, almost three years later. I thought this might be of interest as we will be moving out of this studio soon. 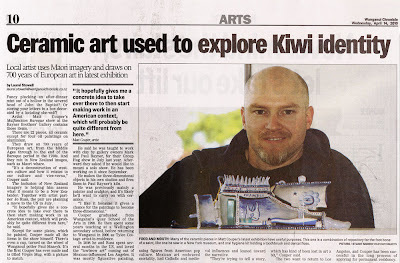 A newspaper article by Laurel Stowell of the Whanganui Chronicle. It was in last Wednesday's paper, but I only got to see it yesterday, since I've been down in Wellington. If you click on the image below, it will enlarge so you can read the text.